Earlier this month, Kuwaiti Emir Sheikh Sabah Ahmad Al Sabah has pardoned 33-year Ugandan domestic worker Fatuma Nambi, who was sentenced to 5 years for having a baby outside of wedlock. The Emiri Pardon Committee recommends candidates jailed on minor charges and with a record of good behavior to the Emir. Fatuma was released last week and returned to Uganda with her baby after serving eleven months. Migrant-Rights.org had earlier documented her story. She spoke to us on her return to Uganda. Her life was changed when her employer’s family went to Mecca for Umrah, leaving her alone to take care of a three-story home. 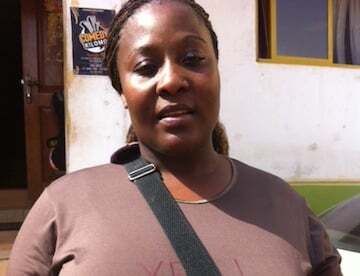 She began to get close to some Ugandan men working as security guards, visiting the duo in the evenings to watch some local Ugandan music and kill the boredom. She assumed she was safe because the two men shared a single room but on one of such visits, one man left the room. That day she got pregnant. When she told the man responsible, he advised her to return to Uganda, and cause no problems. She requested emergency leave from her employer without divulging her pregnancy, but her sponsor refused, saying she must complete the two-year contract. The relationship with the man also deteriorated as he assumed Fatuma refused to quit her job and return to Uganda for a safe delivery. Migrant domestic workers have little access to reproductive health care. Migrant domestic workers who become pregnant are stuck with only dangerous choices: conceal the pregnancy and the baby, or face jail time and eventual deportation. Newborns are frequently abandoned, or in the worst case scenarios murdered, to avoid punishment. Domestic workers are put through a trial, often have zero access to legal support or even translation services. Though mothers and children are held in special prisons together, emotional support and psychological care is not provided. Uganda does not have a proper pre-departure orientation for domestic workers. One night, after the family retired to their bedrooms, she gave birth alone in her bedroom. All day, she had struggled to mask her labour pains from her bosses. The next morning, she had resumed her daily chores, changing little in her routine except that she now had the task of hiding her baby; “I kept her almost in every place, from the cupboard to the kitchen, the bathroom and even my bedroom,” she said. On the second day, the baby cried louder. Her madam asked where the sound was coming from, and it was then that she admitted to having a baby. “Madam’s first main concern was to be sure the father of the baby was not living in the house, she demanded to see the baby, asking questions like who is the father and when she noticed the eyes were black she was relieved,” she said. Her ‘madam’ then started making calls, asking friends on how she could help her maid and the baby. Everyone advised her to surrender her to police. For another four days, the two kept it a secret from the rest of the family that there was a new baby in the house. The madam even suggested to Fatuma to drop the baby at the mosque in the morning so that the government could take care of it, but Fatuma refused. Once the head of the family was told, he immediately panicked and told Fatuma they had to take her to the hospital. The hospital administrators called police and there, Fatuma was arrested. Fatuma said her court hearings were all in Arabic and she had no legal representation. She could not understand a single thing said in court. She was repeatedly presented in front of the judge and then dismissed for about two months, until her sentencing. Prior to her sentencing, the prosecution team used some English to give her the option of revealing the father’s name in exchange for a reduced sentence. She refused. In prison, Fatuma had asked her family to send her the money she had sent home as savings, in order to arrange for a lawyer. She then found out that her brother had stolen all of her money. Wage-theft by relatives is a common issue for domestic workers. Her prison room held other mothers with children outside of wedlock. Those serving the full five-year sentence stayed together, while those who had named the fathers of their children, and received half the sentencing, stayed in another room. She recalled some positive moments, including that children could play with one another, and that there was plenty of food available.